Fully automatic wireless car charger with built-in infrared sensor. Easy to use for safe driving. Overvoltage, overcurrent or metal objects are detected while charging, it will stop charging immediately to protect your phone. 360 degree rotatable joint allows you to freely adjust the viewing angle. Keep your phone securely attached even when you're driving on bumpy road. Fully automatic wireless car charger with built-in infrared sensor. The two clips will auto open and grip your phone when you put the phone close to the holder. And you can take the phone out by simply touching the left side button. Easy to use for safe driving. No need to plug in, just set your phone down and go. Fast charging supported devices will charge at 10W. A0608 wireless car charger emphasize security and provides multiple protection. When overvoltage, overcurrent or metal objects are detected during charging, it will stop charging immediately to protect your phone. 360 degree rotatable joint allows you to freely adjust the viewing angle. Convenience to watch and operate your phone. Easy to set up. It can be installed to either your windshield or dashboard with an strong suction cup. 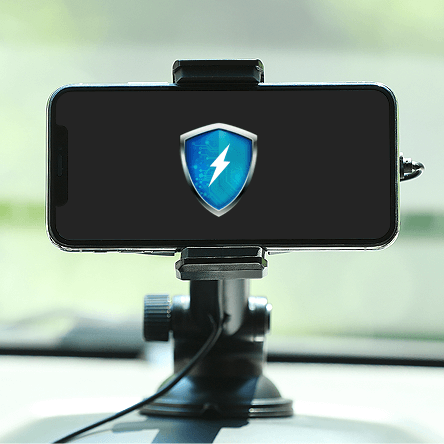 Keep your phone securely attached even when you're driving on bumpy road.